Hello, friends, and welcome to Episode number 10 of The Greg Amundson Show. I’m so happy and grateful to be able to share this time with you today. And my friends, listen carefully. I sincerely believe that wherever you are in the great journey of your life, in this moment you need to hear this message. 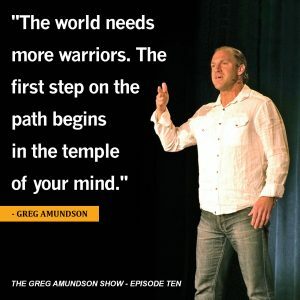 Our episode today is dedicated to providing you with encouragement along the warrior’s path. Let’s look carefully at the two words in our title. Encouragement and warrior. My friends, I sincerely believe that every single one of us has an innate warrior spirit within us. And it is absolutely vital that we embrace and harness and forge and temper that warrior spirit. Because that spirit of the warrior within us is absolutely vital and necessary in the accomplishment of our life purpose. One of my favorite bedtime stories when I was growing up was told to me by my dad. I’ve always cherished this story. This story is very popular in the Christian faith. This story’s title is Footprints. Many, many years ago an old man came to the end of his life. As he ended his life on Earth, he awoke in the loving embrace of Christ. And Christ and this old man begin to walk along a beautiful seashore. Together they were reviewing all of the ebb and flow of this old man’s life. And the old man noticed that there were two sets of footprints in the sand. Yet he also noticed that during the very challenging, in fact the lowest times of his life, there were only one set of footprints. This greatly saddened and troubled the old man. Wow. What a powerful story. The message in my mind as I share this story is my hope for you that you can find in that story and in the totality of the message that we share together today a great a deal of encouragement. Isn’t it encouraging to know that as you and I go through our life, as we experience the ebb and flow of our life, we are always in the presence of God. In any given moment of our life, we can look to God for help, for support and for encouragement. Let me share with you something remarkable that my mother once told me. And what’s really incredible about these words I’ll share with you in just a moment is these are the last words that my mother spoke to me before she passed away. My mom had been in and out of a coma following a severe stroke that she had in, of all places, Jordan. My mom was in Jordan serving with the Peace Corps, had a massive stroke from an undiagnosed huge growth in her brain. And she was medically evacuated back to first, UC Davis Medical Center then she went to Dameron Hospital for a period of time and ultimately back to UC Davis where she passed away. Yet it was at Dameron Hospital with me seated at the foot of her bed that she came out of this coma that she was in. And she looked at me and with a great urgency in her voice. As if she was sharing a message with me that was given to her from beyond our understanding of space and time. She looked at me with this urgency and enthusiasm. She said, “Greg, everybody can encourage somebody and be supported at the same time.” And after that my mom and I held eye contact. And I embraced her. And she stayed with me for several more minutes and then dozed off and fell asleep. Those words, to this day rings so true in my mind because as I reflect over my life, what I found is at the critical junctions in my life, I was supported. At the critical junctions in my life, there was someone there that was able to give me a word of encouragement. And the words of my mom are so important for you and I to understand. Because my friends, I believe that very often, God is speaking through you and I a word of encouragement to another person. Perhaps that person is a loved one. Or perhaps that person is a complete stranger. Let me share with you an amazing moment in my life. When I was serving as a special agent with the DEA, I was stationed in El Centro, California. When I wasn’t actively pursuing with my co-agents the major drug cartels in Mexico, I was speaking at low-income schools in the San Diego and Imperial Valley. I was speaking to young kids about the dangers of drugs, about the dangers of violence and about the dangers of gangs. And it was my hope that I could reach a child at a young age and provide them with encouragement and support. And so that they would not be tempted into the life of drugs and violence and gangs that was so tempting along the US-Mexico border. Now, the young boy was much shorter than I was so I bent down to his approximate height, reached out my right hand for a high-five while simultaneously saying, “That’s great! You can do it!” I was expecting the high-five. Yet the high-five never came. Well if you know me or if you’ve read any of my books or tuned in to this podcast then you probably know that I’m a very optimistic guy. And so in that moment, I thought to myself, “Well, hopefully his dad is an astronaut. Or a rocket scientist. Or a doctor. Something amazing.” And so of course his dad wants him to grow up and be just like him. Well, in that moment, time stood still for me, my friends. Time stood still. And I realized that this young boy who was in my presence in that moment had never heard from his father a positive word of encouragement. He’d never heard from his dad, “Son, you can do it. Son, I believe in you. Son, you can accomplish your dreams and goals. Son, I support you. Son, I will encourage you.” He never heard those words. And those were the words that I heard every single night before I went to bed from my dad. And this young boy had never heard a word of encouragement from his own father. And I started to think to myself, “When’s the last time this young boy has heard a word of encouragement?” Not just from his father, but from anybody in his life. Was that word of encouragement that I had just given him moments before, that “You can do it!” Was that the first word of encouragement that he’d heard that day? That week? That month? That year? Maybe that lifetime? And it made me realize, my friends, you and I never know. We can’t even fathom the way that God is working through our life through our very voice on a day-to-day basis. Doesn’t that make you want to cherish your words? To be a little bit kinder. To be a little bit more gracious. To be a little bit more loving. To be a little bit more encouraging with everything that you say? Something else remarkable about that young boy and that moment in his life. When it comes to walking the warrior path, pursuing our life purpose is that there’s an incredible story about Jesus Christ. In His declaration of His life purpose, He was told, “That is not your purpose. And you cannot fulfill it.” You see, the first time that Christ publicly ministered in the synagogue, He read from the scroll of Isaiah. And while reading from the scroll of Isaiah, He said, “Behold! The Spirit of the Lord is upon Me. I am anointed.” And then He went on to tell everyone who was there that day in the synagogue the purpose of His life. To which someone in the audience said, “I know you. Aren’t you Joseph’s son?” Meaning, “You’re just a carpenter.” Because at that time, a boy would grow into the footsteps of his own father.” Isn’t that amazing, my friends? That that young boy whom I spoke to in El Centro told he was going to grow up and be just like his dad. And that is the exact same prophecy that a complete stranger gave to Jesus Christ, the Savior of the world. And what it makes me realize my friends is that when you and I step on to the warrior’s path. Meaning that when we commit to pursuing the purpose of our life, it’s very likely that there will be opposition along that path. The opposition may very well come from loved ones. From family members. From friends. Perhaps from strangers. Or this challenge that we face, this opposition to our life purpose may very well come from within our own mind. From within the temple of our own mind. Our own thought process may try to defeat us. And this is why our episode today is encouragement on the warrior’s path. Because as we pursue the purpose of our life, we need to embrace the warrior spirit. It will take no less than the spirit within you, my friends, to accomplish and to fulfill the purpose of your life. Along the path of the warrior. Along the path of your life purpose, it is absolutely vital that you discipline yourself to be very mindful of where you are giving your attention. The reason for this is that Jesus Christ in the Sermon on the Mount said, “If thine eye be single, then thy whole body shall be full of light.” And my friends, that’s statement is the summation of all truth. If thine eye be single, then thy whole body shall be full of light. You see, my friends, whatever you are giving your attention to, that is the thing that will govern your life. I recall when I was preparing to give the very first CrossFit goal-setting seminar. God put on my heart this statement that has been with me ever since. God put on my heart, “Greg, whatever you focus your attention on will increase in your life. Energy will flow from you onto the object of your attention. Therefore, the object of our attention, meaning our focus, our attention needs to be first and foremost, on God. The tendency of the mind is to direct our attention onto the material world, which is always changing. Whereas if we direct our attention to the presence of God, which is the same yesterday, today and forevermore then and only then as Christ tells us will our body, meaning the experiences of our life, only then will they be full of light. My friends, I also want to read you a very short few sentences from a dear friend of mine’s book. This book is called A Warrior’s Faith, by a genius author and dear friend of the warrior community named Robert Vera. In his book, on page 134, Robert writes I think the most beautiful few sentences in the totality of his book. And so my friends, you see what I really want to do is encourage you that on this life, on this path, on this journey that you and I are all on to be a little bit more loving, supportive and encouraging of each other. Yet remember, oftentimes, when we’re on this path, the enemy that we really need to be aware of in our life is our own negative thinking. And so I’m also encouraging you not to only be encouraging to other people, meaning the external environment in your life, but to be a little bit more loving and encouraging and supportive of none other than yourself. And I always answer in the same way, and that is, “Yes, I sincerely believe that God gave each and every one of us a very special, a very unique life purpose. A mission in essence. A mission that each one of us has to fulfill. And this particular devotional speaks to that truth that I hold in my heart. This devotion is from June 30th. Although you can choose to follow any path during the great adventures of your life, only one path was made just for you. You have unique talents and ways of expressing your divine gifts that God intended exclusively for you. These talents and gifts are for your benefit and for the benefit of everyone you come into contact with. When you shine the great light within you, God magnifies the intensity of your power. Therefore, do not let anyone or anything dim your light or convince you to follow a path you feel distant from. Hold tightly to the hand of God and allow His leadership to guide your thoughts and actions. You were divinely created for goodness, for justice and to joyfully express the great heart within you. Well, my friends, I just want to be a voice of encouragement in your life today. If you haven’t heard the words, “You can do it!” If you haven’t heard the words, “I believe in you!” If you haven’t heard the words, “I believe that you have what it takes to accomplish your dreams and goals!” Then I’m grateful that my voice can be that voice in your life that you may need to hear today. My friends, in conclusion I pray that God would bless you. That he would watch over you. And that ultimately God would be that great source of encouragement and fulfillment in your life. Take care, my friends, and I will talk to you again soon back here on our next episode together of The Greg Amundson Show. Take care!